Welcome to the Breast Cancer Awareness Blog Hop. The purposes of this Hop are to, first, encourage early diagnosis. 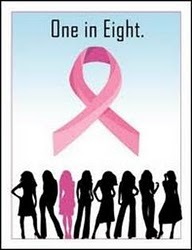 You could be the One in Eight women who has breast cancer this year. Have you had your mammogram? With early diagnosis, breast cancer can be beaten! Second, please invite your family and friends to see the projects we've made to offer hope and support. Each of us has been touched by breast cancer, whether we have had a friend or relative with the disease, or whether we have journeyed the Pink Road ourselves. My friends Linda and Marjie are both currently on the difficult road of treatments for breast cancer. 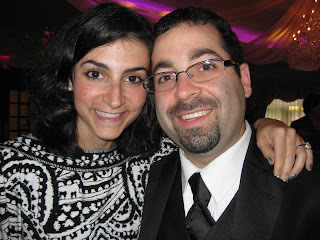 Each is in a different stage of cancer treatments, and neither is on an easier journey. 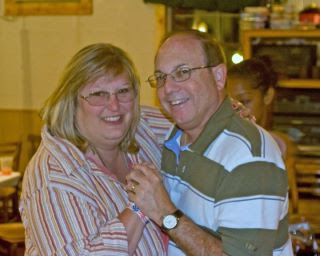 Linda, pictured with her hubby Rob, began wicked chemo treatments just 25 days ago. Linda's spirit is amazing, she is joyful, positive and inspirational. I met Linda through her hubby Rob. Five years ago, Rob came to a garage sale I was hosting and bought a book. We got to talking, and I told him I was selling my stuff because I was cleaning to get ready to move. Turns out Rob and Linda work as a Realtor team, and Linda was my fantastic selling agent for my home. It's all about relationships, and Linda is a Queen!! This is the card I made for Linda, as part of this Hop. I made a frame from chipboard, covered it with pink (of course!) ... and before I mounted it to a white card, I sandwiched some ribbon between the frame and the card. 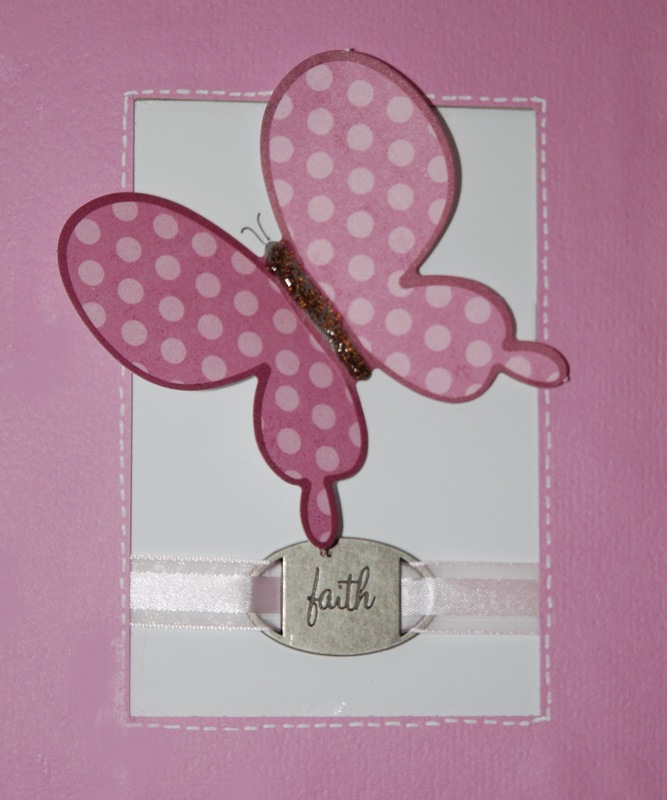 A pretty metal embellishment ("faith") sends the message of hope. The butterfly is a pre-made, purchased embellishment that I adorned with a Stickles body. Today, I will mail the card to Linda, with my love and support. If you know of someone who is in this fight for her life, remember her today ... with a hug, a card, a telephone call, some flowers, a home cooked meal, whatever you think will bring her joy. So don't forget to follow (see link in the right hand column) ... leave a comment that includes a way for me to contact you when you win. Sponsor Jillian Vance is offering a set of her stamps! 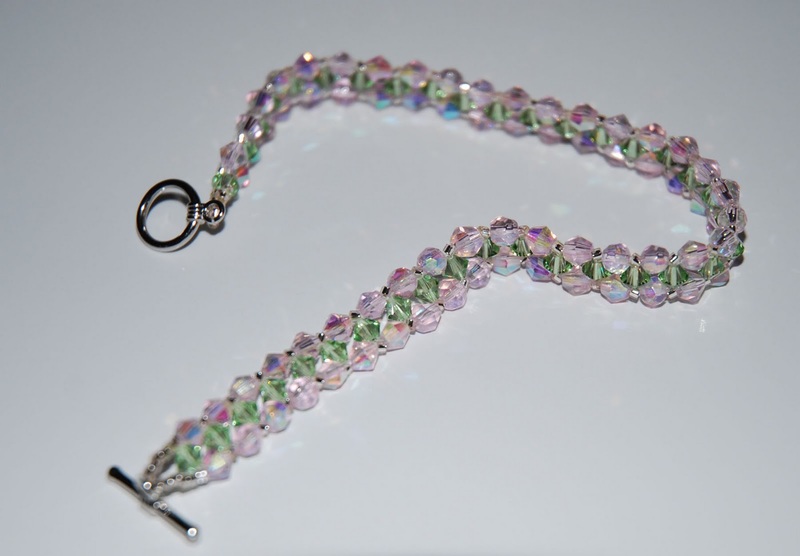 Sponsor Designs on Cloud Nine has provided a $20 gift certificate to use on her site. Sponsor Crafty Card Gallery has provided a $10 gift certificate to either Amazon.com or OhMyCrafts! To qualify for our Hostess's grand prizes, you need to leave a comment at every blog hop stop and become a member/follow each one too (and mention that in your comment). Dee would love it if, after you're done the Hop, you would stop back to her at the beginning at http://vintageheartfeltdesigns.blogspot.com and let her know what project you like the most. If you need the full list of blog stops, hop on over to Dee's blog! LOVE that card, The frame makes the sentiment stand out and that butterfly is just awesome! TFS!!! Oh I do like butterflies and this one is just awesome! I know she is going to love the card. Thanks for sharing their stories and I'll be praying for them and their total healing. Love your projects and love the stories of those fighting which make the hops so much more personal. Cancer can be a scary thing but attitude is so important. Thanks for sharing the photos of your smiling friends. Ellen thank you for sharing your stories and I wish you friends lots of love and sending prayers their way. Simply stunning card and love what you have done. Your card is beautiful and your friends stories are an inspiration. I am a follower. I look forward to our crop day on 10/23 being hosted by Susan. Your stories were sad but showed the courage you need to beat this nasty disease. TFS. I loved your card. Jearise in Lorby's World. Very pretty card! The butterflies are so pretty and perfect for this. Lovely the card Ellen! Butterflies are beautiful, and a great symbol of hope and inspiration. Well done on being part of such a worthy cause. LOVE your butterfly!! As a mammographer, Breast Cancer Awareness is a cause that is close to my heart. Thanks for helping spead the word!! Great card. Super love the faith charm. p.s. it's 55 now!!!! YAY!!! Love this card. Ellen, your projects are always great & this is no exception!